We all know we should eat a diet rich in fruits and vegetables. The “eat your vegetables” mantra of parents worldwide is reinforced in our minds from the time we are small children. And, most of us know that a diet high in vibrant-colored foods is the key to great health. But, a new study shows that if you’re trying to reduce your heart disease risk or trying to address the condition, you’ll want to focus on particular shades of foods in the rainbow spectrum of colorful fruits and vegetables. A new study published in the medical journal Critical Reviews in Food Science and Nutrition found that foods high in nutritional compounds known as anthocyanins significantly reduce heart disease risk. That’s great news for the 84 million people already suffering from heart disease, as well as the many people trying to avoid the condition altogether. Sadly, approximately 2200 people die from the condition every day, according to Johns Hopkins Medicine. But, heart disease is highly treatable with some dietary modifications. According to the new study, one of the best ways to treat or prevent heart disease is by focusing on foods that are rich in anthocyanins, the compounds that give foods like blueberries, raspberries, blackberries, cherries, purple cabbage, eggplant and other deeply-colored fruits and vegetables their deep reddish, bluish or purplish tones. Anthocyanins are members of a potent family of antioxidant compounds known as flavonoids, which protect against damage and degradation of the cells by harmful free radicals. In this study, researchers reviewed 19 other studies of over 602,000 study participants from the United States, Australia and Europe, who had been monitored for between 4 and 41 years to determine how their anthocyanin intake compared with their incidence of heart disease, as well as heart attacks and strokes linked to the condition. The researchers found that those with the highest dietary intake of anthocyanins had the lowest risk of heart disease. High anthocyanin intake was linked with a 9 percent reduced likelihood of experiencing heart disease and an 8 percent reduced risk of death due to heart disease. 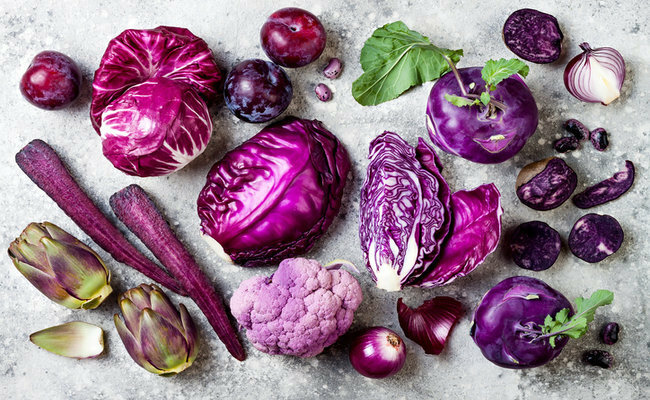 To date, over 635 different anthocyanins have been identified by scientists, but it isn’t necessary to know all of their names to start benefiting from their heart-healing properties. And, a high intake of anthocyanins can have many additional health benefits as well, including helping with eye health, maintaining the health of the brain and keeping the immune system strong. Anthocyanins also have potent anti-cancer properties, according to research published in the British Journal of Pharmacology. The scientists behind this study found that anthocyanins exert their anti-cancer effects in many ways, including as antioxidants, anti-inflammatories, preventing the mutation of cells typically linked to cancer, inhibiting cancer cell proliferation, stimulating cancer cell suicide (known as apoptosis), preventing cancer from spreading elsewhere in the body and even making cancer cells more sensitive to chemotherapy. Try to eat at least one serving of these brilliantly-colored fruits and vegetables every day to reap their many healing benefits. Considering how delicious these foods are, that should be a fairly easy and enjoyable task.